I’m listening to his bumbling arguments scraping the bottom of the barrel of excuses to launch a new war in Syria. He sounds like a moron war criminal Beavis (from Beavis and Butthead). Sickening. As we should all be realizing, the problems of this world are more often than not manufactured for the nefarious purposes of the economic power-elites who benefit from them. The partisan argument then becomes a sad joke just like our democracy. U.S. policy has undermined efforts to bring the Syrian people the ceasefire and peaceful political transition they need. President Obama’s threats against Syria are framed by the carefully crafted image of a responsible superpower reluctantly drawn into a horrific conflict caused by others. But the reality is very different. For more than two years, U.S. policy has quietly fueled the escalation of the conflict in Syria and undermined every effort to bring the Syrian people the ceasefire and peaceful political transition they need and want. Whoever is directly responsible for hundreds of deaths in the latest alleged chemical weapons incident, the critical covert and diplomatic role the United States has played in a war that has killed at least 100,000 people means that their blood is also on our hands. 1) As protests spread through the Arab world in 2011, the mostly leftist groups who organized the Arab Spring protests in Syria formed the NCB to coordinate peaceful protests and resistance to government repression. They agreed, and they still agree, on three basic principles: non-violence; non-sectarianism; and no foreign military intervention. But the U.S. and its allies marginalized the NCB, formed an unrepresentative “Syrian National Council” in Turkey as a government-in-exile and recruited, armed and trained violent armed groups to pursue regime change in Syria. 2) The United States, the United Kingdom, France, Turkey, Saudi Arabia and Qatar began flying in fighters, weapons and equipment to turn the Syrian Spring into a bloody civil war. Once they had overthrown the government of Libya, at the cost of 25,000 to 50,000 lives, they began adapting the same strategy to Syria, despite knowing full well that this would be a much more drawn-out, destructive and bloody war. 4) Over the past two years, we have learned more about who is doing what in Syria. Anti-government sources acknowledged in June 2013 that 2,100 of the 16,700 rebel fighters killed so far in Syria were foreigners, while only 145 of 41,600 loyalists killed in action were foreign Hezbollah members. 5) Journalists in the Balkans have reported that wealthy Gulf Arab paymasters fund hundreds of hardened mercenaries from Croatia and elsewhere, who earn up to $2,000 per day as rebel snipers and special forces in Syria. Saudi Arabia has sent convicts to fight in Syria as an alternative to prison and funded shipments of weapons from Croatia to Jordan. Qatar has spent $3 billion to pay rebel fighters and ship at least 70 planeloads of weapons via Turkey. 6) On the diplomatic front, as Haytham Manna told Le Vif, the United States has played an equally insidious role. As Kofi Annan launched his peace plan in April 2012, the U.S. and its Western and Arab monarchist allies made sure that their Syrian proxies would not comply with the ceasefire by pledging unconditional political support, backed up by more weapons and generous funding. 7) The US joined France and its other allies at three Orwellian “Friends of Syria” meetings to launch what French officials referred to as a “Plan B”, to escalate the war and undermine the Annan peace plan. At the second Friends of Syria meeting, nine days before Annan’s ceasefire was due to take effect, the U.S and its allies agreed to provide funds for the Free Syrian Army to pay its fighters, while Qatar and Saudi Arabia pledged to increase their supply of weapons. 8) Annan finally assembled all the permanent members of the Security Council and other governments involved in the war in Syria in Geneva at the end of June 2012. The Western powers briefly dropped their previously non-negotiable demand to remove President Assad as the first step in a political transition, so that all sides could finally sign on to the Annan plan. But then the U.S. and its allies rejected a UN Security Council resolution to codify the agreement and revived their previous demands for Assad’s removal. 9) In May 2013, after tens of thousands more Syrians had been killed, Secretary Kerry finally went to Moscow and agreed to renew the peace process begun in Geneva in June 2012. But since May, the United States has once again reneged on the Geneva agreement and chosen to escalate the war even further, by providing direct weapons shipments and now missile strikes to support its proxies in Syria. So, far from being reluctantly dragged into a terrible conflict not of its own making, the United States and its allies have in fact followed a quite coherent policy of regime change, modeled roughly on their successful overthrow of the Libyan government in 2011. The main difference has been the absence of foreign air support for the Syrian rebels. In Libya, NATO conducted 7,700 air strikes, demolishing Libya’s air defenses in the early stages of the campaign and thereafter bombing at will throughout the country. The fact that Syria possesses a far more extensive, modern, Russian-built air defense system has successfully deterred the West and its Arab royalist allies from following the same strategy in Syria. But enough details have now emerged of the true contours of this policy to make his crocodile tears for alleged nerve agent victims seem grotesque. The atrocious position in which he has placed the American public in whose name he acts should spur outrage, at a political class who connive in such cynical and murderous policies; at commercial media who laugh all the way to the bank as they misinform and mislead us; and yes, at ourselves for being patsies for serial aggression and genocide, in Vietnam, Iraq and now Syria. To paraphrase Mr. Obama speaking in Sweden on Wednesday, the world set a “red line” when the UN Charter prohibited the use of military force except in self defense or in legitimate collective security operations mandated by the UN Security Council. The US Senate set a “red line” when it ratified the UN Charter by 89 votes to 2. As Obama said, “The international community’s credibility is on the line, and America and Congress’s credibility is on the line because we give lip service to the notion that these international norms are important.” And when we are talking about war and peace, it is not just our credibility that is on the line, but the very nature of the world that we live in. So please take a few minutes and call your “Representatives” in Congress to insist that they vote “No” on the authorization of U.S. aggression against Syria. Ask them instead to pass a resolution recommitting the United States to the June 2012 Geneva peace plan, which starts with a ceasefire by all parties to the conflict, including the United States. 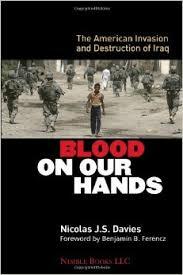 Nicolas J. S. Davies is author of Blood On Our Hands: The American Invasion and Destruction of Iraq. He wrote the chapter on “Obama At War” for the just released book, Grading the 44th President: A Report Card on Barack Obama’s First Term as a Progressive Leader. In practice, as President Obama implied, the U.S. government has played a “disguised, quiet, media-free” but nonetheless significant role in the escalation of violence in Syria. As early as last December, even as a Qatari-funded YouGov opinion poll found that 55% of Syrians still supported President Assad, former CIA officer Philip Giraldi reported that unmarked NATO planes were delivering weapons and militiamen from Libya to Turkish air-bases near the Free Syrian Army (FSA) headquarters in Iskanderum. British and French special forces were training FSA recruits, while CIA officers and U.S. special forces provided the FSA with communications equipment and intelligence. Turkey was already committed to attacking or invading Syria whenever the West gave the green light. Obama didn’t bother to mention the new hope for a peaceful settlement of the crisis with the appointment of Kofi Annan as a U.N. Special Representative to Syria just a few days before this interview. In fact, just as Kofi Annan launched his last-ditch peace plan, the U.S. and its allies took critical steps to ensure that the forces they were supporting in Syria would keep fighting, instead of agreeing to the ceasefire that was the essential first step in Annan’s plan. President Sarkozy of France initiated a series of international meetings under the Orwellian rubric “Friends of Syria,” at which the U.S., its NATO allies and the absolute monarchs of the Gulf Cooperation Council (GCC) publicly offered unconditional support to their Syrian proxies instead of pressing them to cooperate with the Annan plan. Saudi Arabia and Qatar pledged more weapons, backed by a U.S. commitment of $15 million in “non-lethal” aid, including satellite radio systems like the ones NATO’s proxy forces used in Libya in 2011. As the New York Times noted in June, “What has changed since March is an influx of weapons and ammunition to the rebels.” The same article described Turkish Army trucks delivering anti-tank weapons to the Syrian border, and CIA officers in southern Turkey controlling the flow of weapons into Syria. The timing of the three “Friends of Syria” meetings could not have been worse for any hope that Western-backed forces would comply with the Annan plan. The first meeting was held in Tunisia the day after Annan’s appointment and the second was in Istanbul on April 1, nine days before the initial cease-fire was due to take effect. At that meeting, the Syrian National Council (SNC) declared it would use its newfound financial support to start paying salaries to FSA fighters, a timely move that discouraged rebels inside Syria from laying down their arms. It’s no coincidence that the main “outside” players in Syria’s civil war are the same countries that led and supplied the “NATO rebels” in Libya in 2011, in a war that cost at least 25,000 lives and plunged Libya into a state of chaos with no clear end in sight a year later. U.S. officials pay lip-service to the obvious differences between Libya and Syria, but their actions and those of their allies reveal that the same forces are trying to adapt what they see as a successful regime-change strategy in Libya to achieve a similar goal in Syria, knowing full well that it will be even more bloody and destabilizing. The Western media have stoked fears of impending bloodbaths and cast the schemes of Persian Gulf emirs and Western policy-makers as reluctant “humanitarian interventions.” The resulting violence has been far greater than the violence it claims to be preventing, but this predictable cause and effect has been easily buried in the frenzied media coverage of escalating wars. Rwanda, where the West failed to intervene, is pulled out as a trump card to justify each new intervention, establishing a pattern in which the West has ensured maximum violence everywhere — on the one hand by failing to stop genocidal violence in Rwanda and the DRC and on the other hand by aggression and escalation everywhere else, from Kosovo to Syria. One of the defining bifurcations of the future will be the conflict between information masters and information victims… [Information] seduces, betrays, yet remains invulnerable. How can you counterattack the information others have turned upon you?… Societies that fear or otherwise cannot manage the flow of information simply will not be competitive. They might master the technological wherewithal to watch the videos, but we will be writing the scripts, producing them, and collecting the royalties. Our creativity is devastating… The de facto role of the US armed forces will be to keep the world safe for our economy and open to our cultural assault. To those ends, we will do a fair amount of killing. We are building an information-based military to do that killing… We are already masters of information warfare. And so, in Libya, the “information masters” ensured that the world saw only the rag-tag NATO rebels, never the British, French and Qatari special forces that armed, trained and ferried them along the coast on board NATO warships and led them to victory, even when Qatari special forces led the final assault on Libya’s Bab Al-Azizia military headquarters in Tripoli. U.S. forces were even more invisible, as they “led from behind” and conducted their share of 9,700 total air strikes in six months, the heaviest bombardment anywhere since Iraq in 2003. The critical difference was the role of the U.S. and its allies: the “information masters.” In response to rebellions in Libya and Syria, Western politicians and media used pro-Western exile communities as critical tools in their regime-change strategies, shaping narratives that ensured Western public support for violent anti-government forces. They promoted exile groups as governments-in-waiting in a way that would have been unthinkable in Yemen, Bahrain or Iraq, where U.S. special forces instead continued to train and support regime forces as they committed atrocities that Western media consumers were only dimly aware of. From the outset, the U.S. and its allies selectively supported the Turkish-based Free Syrian Army and Syrian National Council (SNC) instead of the National Coordinating Body for Democratic Change (NCB)that was formed by the political opposition that took to the streets in Syria in March 2011. The Western “information warfare” narrative that peaceful protesters were forced to take up arms by the severe repression of the Syrian government ignores the clear distinction between the NCB and the FSA, and it fails to explain why this only appears to have happened in Libya and Syria. The NCB was formed in June 2011 by 15 opposition groups and several independent figures who were leading anti-government protests. The three fundamental principles they have consistently agreed on are nonviolence, non-sectarianism and opposition to foreign intervention in Syria. Their detailed plan for a political transition in Syria has many common points with Kofi Annan’s peace plan, suggesting broad Syrian and international agreement on a way forward that belies Western claims that no political solution exists and that violent regime change is the only viable option. These common points include the release of political prisoners; withdrawal of the army from urban areas; allowing foreign journalists free access throughout the country; and a political transition leading to free and fair elections. A review of the 15 parties that make up the NCB helps to explain why capitalist Western governments and their monarchist Arab allies do not support it. It is chaired by Hassan Abdul Azim, the leader of the Democratic Arab Socialist Union, and it includes the Arab Revolutionary Workers’ Party; the Communist Labor Party; the Democratic People’s Party; Together for a Free Democratic Syria; the Arab Socialist Movement; and the Syrian Union Party; along with four Kurdish parties and several regional parties. The NCB has serious differences with the Turkish-based Syrian National Council (SNC), which the “Friends of Syria” meeting on April 1, 2012 recognized as “the umbrella group under which opposition groups are gathering.” Despite these differences, the NCB has tried to engage with the Western-backed opposition-in-exile. It has taken part in meetings with the SNC and other groups to try and develop a unified political opposition in Syria, and NCB delegations have travelled to Moscow, Beijing, Tehran, and Arab capitals, and met with Western ambassadors in Syria. The armed groups and the military solution adopted by the regime have eradicated civil resistance. So, whatever the strength and the number of peaceful demonstrations today, they are less than a tenth of what we saw a year ago. There’s a retreat from peaceful action. And today, if there’s a small demonstration in a village, nobody pays attention, as if it doesn’t make any difference. Military action has taken the upper hand over a political discourse that could regroup and create a peaceful solution in the short term in Syria. The idea that something had to be built from the outside weakened what was happening inside the country. They thought that a structure outside the Syrian people could represent it internationally. But it’s a structure that’s really not representative of Syrian society or political forces in the country and, what’s more, it depends on the will of three states: France, Turkey and Qatar. The SNC, despite the financial, diplomatic and media support it has obtained, has not achieved its goal. Now there’s a search for another formula to unify the opposition. Meanwhile, the armed groups have gained ground and become radicalized. Because the money came from Salafist groups all along. This “Salafization” of some of the military groups has plunged us into civil war. On one side, there is fear of extremism in a moderate society where 26 religious and ethnic groups coexist. Foreign intervention, whether it’s official or not, has favored an Islamist ideological trend to the detriment of democratic and secular forces. It’s also favored acts of vengeance and political assassination on a sectarian basis. These acts are manipulated and influenced by non-Syrian jihadist movements that are starting to find a place in the country and who coordinate with the Islamist armed groups. The power vacuum is a danger, because civil resistance is poorly organized or often absent because of the presence of the armed groups. The political solution for a transition period doesn’t exist. There’s no timetable agreed on among different opposition forces. This lack of coordination gives the advantage to the most extreme Islamist groups. Secular leaders were murdered by the regime in the first months, which opened the door to the Islamists. When you marginalize the political solution, you marginalize democratic forces. Annan’s proposals were a chance for a peaceful transition. Sadly, right from the start, Qatar buried the plan and opted to militarize the opposition. Western powers were also thinking of a “Plan B.” So, without regional and international support, a plan like this can’t succeed. They’re leaving arms to settle the issue, whether it’s the loyalist army or the dissident or Islamist armed groups. We will pay very dearly for this absence of a political solution. There are local conflicts breaking out. This is compost for a civil war that can lead to rule by militias, but certainly not to the creation of an army that can protect the population in a time of transition. Clearly, Kofi Annan’s peace plan presented a problem for what Haytham Manna referred to as the West’s “Plan B.” Installing a pro-Western government in Syria as in Libya requires Western-backed forces to gain military control of Syria to dictate that outcome. As in Libya, there are Western-based exiles who could fit the bill, and the SNC could function as “the umbrella group under which opposition groups are gathering,” as the Friends of Syria declared. But the kind of peaceful political transition that Kofi Annan’s plan called for would not achieve that result — there is still too much support for the Baathist government, and the legitimate political opposition inside the country, as represented by the NCB, would not stand for a Western-Islamist takeover of Syria. So, the West’s Plan B seems to require that Syria must first be torn apart by a bloody civil war that will kill hundreds of thousands of people, until Syrians become so desperate that the loss of their sovereignty will seem a small price to pay for a restoration of peace. On the other side, the Syrian government is equally determined to use as much force as necessary to prevent this from succeeding. Lakhdar Brahimi’s effort to revise and revive Annan’s peace plan is a final chance for the U.S. and its allies to rein in their proxies and step back from the brink. The Syrian government agreed to his call for a cease-fire during the three-day Eid al-Adha holiday, but once again, the Western-backed rebels rejected it. The stage is set for far greater bloodshed and chaos, and the U.S. government’s actions have been critical, maybe even decisive, in plunging the people of Syria into this crisis and preventing a peaceful resolution.